If you want to see Seth Rogen playing another buffoonish, Jewish man-child stoner who is fearful about the prospects of growing up then “The Night Before” will certainly make due. Thankfully, there's a little more to it than Rogen's trademarked shtick which also includes great performances from his co-stars Joseph Gordon-Levitt and Anthony Mackie. The three dudes play lifelong friends who have an annual holiday tradition of spending Christmas Eve partying it up while attempting to find out how to gain entry into an elusive, premier holiday party known as The Nutcracker Ball. The film is a mix of stoner comedy cliches and heartfelt holiday cheer that's all at once jarring and yet perfectly captures the anxiety of every thirty-something's feelings about his or her place in this crazy world. Oh, and there are ugly Christmas sweaters of course. 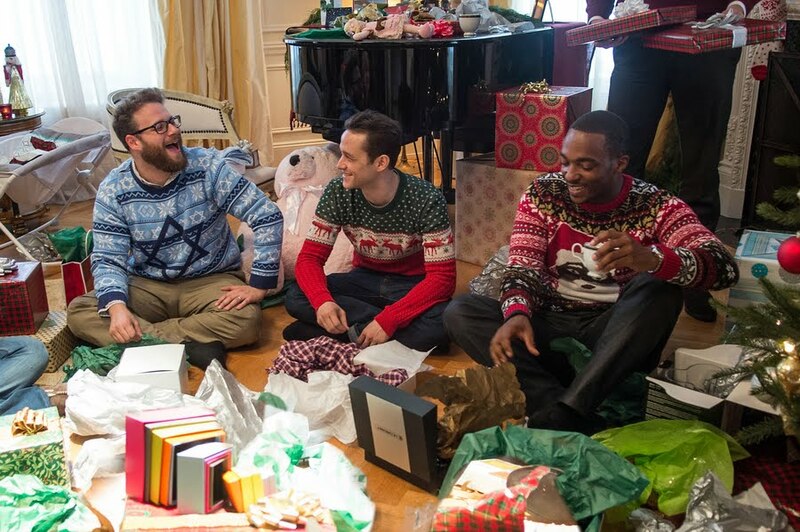 “The Night Before” strives to be the filthiest and most perverted Christmas movie of all time. They basically succeed since the only other options before this were “Bad Santa” and “A Very Harold & Kumar 3D Christmas.” Gordon-Levitt is Ethan the emotional anchor of the film as we learn that his parents died tragically in 2001 and his best friends Chris (Mackie) and Isaac (Rogen) become like his brothers. They begin a Christmas Eve tradition of partying, drug-taking, and other debaucheries that would make Krampus blush. But now it's 2015 and Chris is a professional athlete and practically a celebrity while Isaac has settled down and is, hesitantly, expecting his first child with his wife (Jillian Bell, who's always a hoot). Ethan's life doesn't seem to be going anywhere: he recently broke up with his girlfriend (Lizzy Caplan) and is working a demeaning job as an elf. Ethan comes across three tickets to The Nutcracker Ball and insists on one last glorious Christmas Eve night out with his buddies. Oh what a night it is. “The Night Before” is funny. And none of it will be funny if you read about it here. But what I can tell you is that there are fun cameo appearances and lots and lots of pop culture references. Everything from “Die Hard” to “Home Alone” and even its sequel are referenced almost countless times. Most of this stuff is extremely funny, especially one bit involving mixed up cell phones, dirty photos, and an appearance from one of Rogen's regulars. Other times some of the gags feel forced or overdone. Rogen takes a lot of drugs in the film and many of the gags rely on him being drugged out of his mind. Many of the jokes are practically ruined by the film's trailers including a delightfully sacrilegious trip to midnight mass. Like most of these Seth Rogen comedies, “The Night Before” has a soft, gooey, and sweet center. The friendship between the fellas is palpable and relateable to an entire generation who's afraid to become a full fledged adult. There's also a lot more to Gordon-Levitt's character than you'd initially think going in. That's probably because director Jonathan Levine also did such an amazing job capturing the male friendship in the cancer comedy “50/50.” And of course because Gordon-Levitt remains one of the most charming and delightful actors working today. Unfortunately the script itself is problematic; this movie boasts so many writers that you can practically feel the disjointedness of the entire production. The movie succeeds almost solely on the sheer likability of its cast. Trailer for The Night Before on TrailerAddict.